Sea Blue Island wedding inspiration board. This inspiration board is for the couple who longs for tropical beauty and serene escapes. The main focal points for each inclusion are the soft, pastel colors that evoke feelings of refreshment and peace. Taking cues from the soft ebb and flow of the vivid blue waters, the tablescape starts with pure white linens, flowers and plates. To accompany the stark white design, the designer included gray chevron menus, a popular design element as of late, tropical blue napkins, and blue and white chairs. The center of the table is lined with votive candles, clear stemware and white flower arrangements. It's a soft vision and the added color offers a colorful punch. The bridal party can also be inspired by the colors of the tropics with vibrant blue accessories. The groomsmen can wear ties in the invigorating colors with unique boutonnieres made of starfish and green accents, and bridesmaids can wear dresses that are flirty and fun, while still letting the bride be the center of attention. Bridal gowns can be whimsical and wistful, perfect for a beach escape. Here, this pale gray gown is crafted with layers of chiffon and offers a wild, raw feeling to a beautiful garment. A cake can take many forms with this type of color scheme and landscape. This cake features an ombre light blue color with delicate white lacey icing details on the center of the tiers and a beautiful flower adornment on the side. The invitation suite is also a great way to spice up the design elements of the big day. Think about adding a dynamic color to the envelope or stationery to give guests a glimpse into what your big day will look like. Nature's seaside paradise offers great inspiration for couples looking for a relaxed, laid-back, yet beautiful day to celebrate their unions. Incorporating natural elements, cool colors and bright details can make your wedding day feel like a vacation. Take one bold element and add soft, complementary details around it to make a big splash. 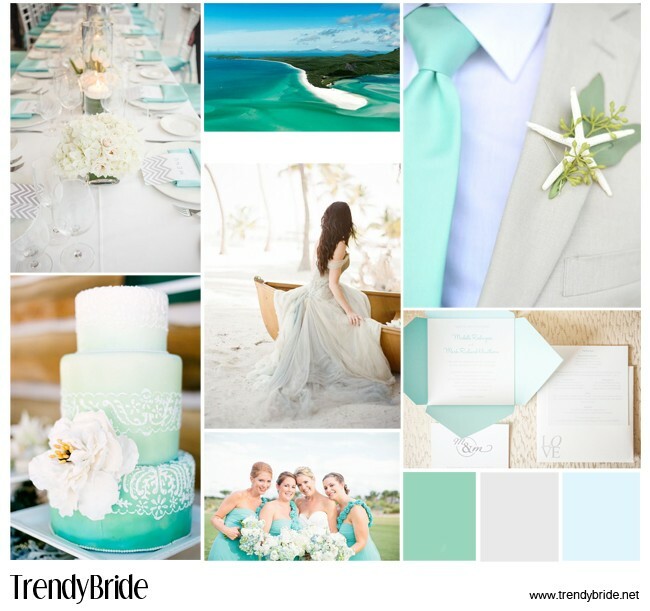 Sea Blue Island wedding inspiration board.